The 3rd Annual Mister Twin Peaks Pageant at Joe’s Pub - more details coming soon! Eye-patched redhead has gone mad. Men in uniform make us pant. 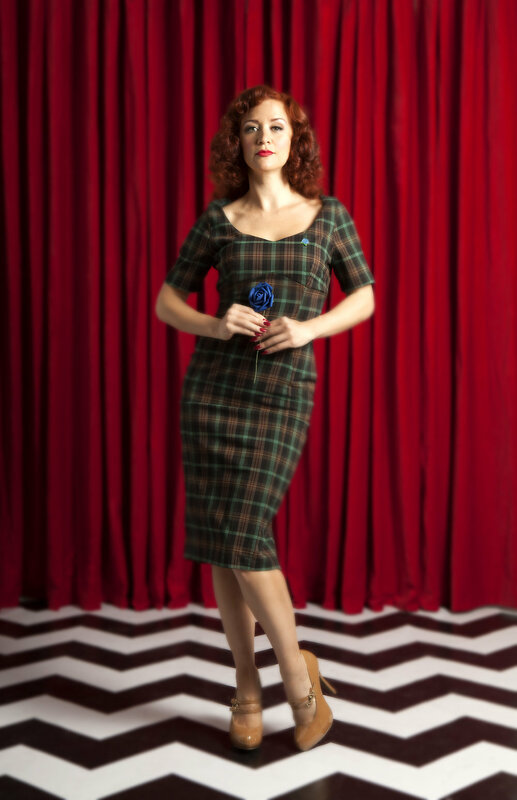 This is why we’re Twin Peaks Chic. Francine is a photographer, performer & the producer of The Pink Room Burlesque. Known as "The Blue Rose of Burlesque", Francine likes to keep some mystery in the air but still needs the freedom to get her work done. Stretchy fabrics that hug curves but leave room to move are essential for a busy go-getter. Whether you're out delivering meals-on-wheels to the elderly or preparing for a late night over Canadian the border, this dress is is perfect for any double life.